Can we talk POTHOLES!? 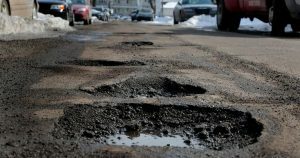 I cannot remember the last time that many potholes, that close together, that you try to dodge one and you hit the next? There was a post on FACEBOOK showing a car being pulled over by the police and when asked, the driver stated he wasn’t drinking; he was trying to save his tires! Drinking is definitely a reason for being pulled over in Wisconsin but funnier that dodging the potholes has been the reasoning instead! Wisconsin has been hit hard by the weather this season. Rain, rain, snow, bitter cold, snow, melt, rain, snow, melt, bitter cold, snow and melt again! And the roads have taken a hard hit! I don’t know if the snow plows have shovels that scoop out the road when they are plowing or there are asphalt demons that think the cars are to abusive, but WOW, there are more potholes than cold mix! MCC, Inc. makes cold mix at the end of the season to hold over the townships, customers and ourselves for spring when the asphalt plants are up and running. Last fall we made 850 ton and as of today, we have none left! And keep in mind that we made about that amount in spring, knowing that there would be some left over in fall to hold over for the winter. 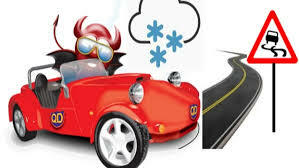 So I guess the question is, will Mother Nature win this battle or will the asphalt demons?! So please watch were you are driving and try to dodge those potholes!